I have always had questions about why my father decided to join The Lutheran Church of the Redeemer on Dale Street. It may have had more to do with language than location. Much of his early schooling and religious training was in German at Emanuel Lutheran, a Missouri Synod Lutheran congregation, on Saint Paul's West side. In 1939, he was newly married, and living at 65 Garfield Street, St. Paul. It was probably at this time that he transferred his membership to Redeemer. 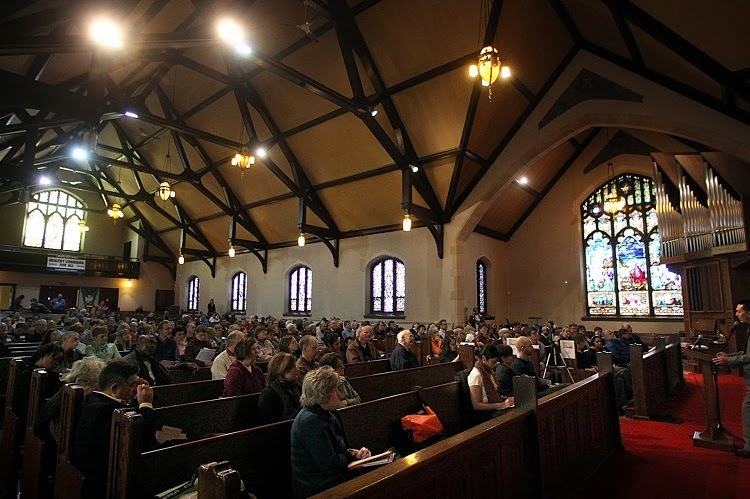 Redeemer was part of the English District, a non-geographical district of the Missouri Synod which was "distinctive among the many immigrant Lutheran congregations because they wanted to give their children the opportunity to worship and receive religious instruction in the English language." From the time I was born and baptized in 1941 through my confirmation and high school years, this was our church home. We never lived near the church so transportation was always a problem, doubly so because Mother never learned to drive and either Dad drove or I took the street-car. None of my school or neighborhood friends went to the church so there was no chance for ride-sharing. My father was a strict church attender and made few exceptions for not being in the church pew on a Sunday morning or a church holy day. I especially never liked the Lenten season when we went to Wednesday and Sunday services and then Easter week added Maundy Thursday, three hours on Good Friday with the Easter Sunday Sunrise Service to top off one long week of church-attending. And for all this you got a little potted plant to take home after the Sunday service to Mom, who was busy preparing the Easter Meal. 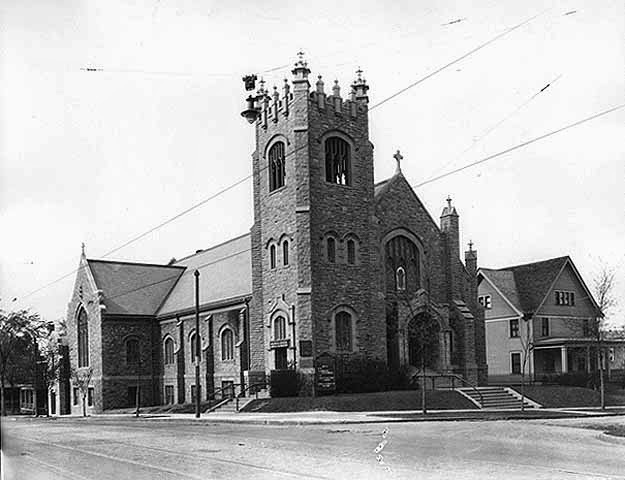 The church was located in what was called the Old Rondo Neighborhood. Rondo had served a number of ethnic groups, including Germans and Jews but in the years of the late 1940's, Saint Paul's Black population was concentrating here and was about 50 per cent of the total. 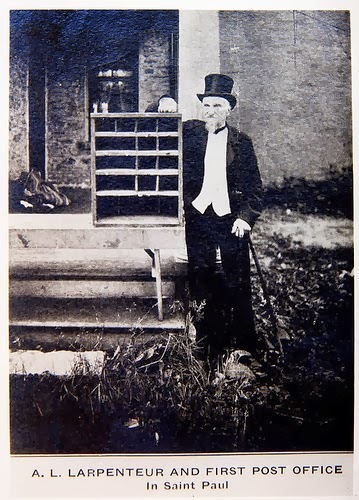 Joseph Rondeau and his family moved to St. Paul after the family was forced out of their residence near Fort Snelling in 1840. They purchased the property and unfinished cabin of Edward Phelan, then in prison for the murder of John Hays. They lived there for a season or two while building a more suitable house. Rondeau only stayed a few years but during that time encouraged a number of new immigrants to build on his land. The Americanized version of his name Rondo was also used for the area’s main commercial street and eventually used to designate the entire area from Marshall to University and Rice to Lexington. Some years later, A. L. Larpenteur acquired a parcel of this land on which to build a country estate. Larpenteur country estate at corner of Rondo and Dale MHS. The property, at that time, was outside the city limits. The acreage was equivalent to 10 city lots and known as the Anchorage. 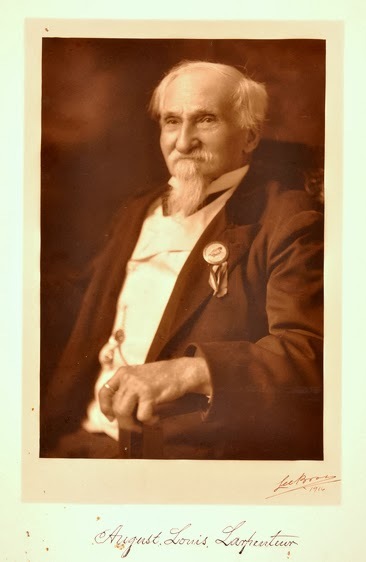 He and his wife Mary Josephine continued to add to the house as their family grew to include 10 children. It stood until I-94 was constructed and the house gave way to "progress". When the house was demolished by the city in 1963, part of the property was used to construct an 150-unit brick nursing home. It was later converted to senior housing. Redeemer Arms bought the building from the The Housing and Redevelopment Authority (HRA) in 1977. Aunt Eleanor, Dad's sister, spent her last days here. A sign for "Old Rondo Ave.: 1865-1966"
Recently it was sold to Minneapolis-based Community Development Housing Corporation (CDHC), and after extensive renovation, was reopened as Dale Street Place Apartments. In the 1920's through 1940's the Rondo neighborhood was the only place to be if you were Black. "There they could own homes and run their own businesses with little interference from the whites, a rare thing in those days before the civil rights gains of the mid-1960s...we had grocery stores here, there were taverns here, there were restaurants, barber shops. A little bit of everything." 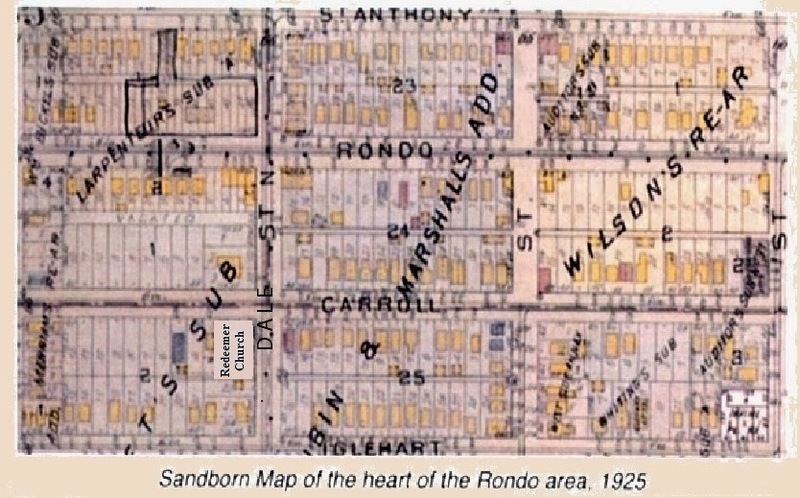 The Rondo neighborhood in Saint Paul was named for Rondo Avenue, which ran east and west for about 1-1/2 miles from Rice Street to Lexington Avenue. The neighborhood included the parallel streets to the North and South. 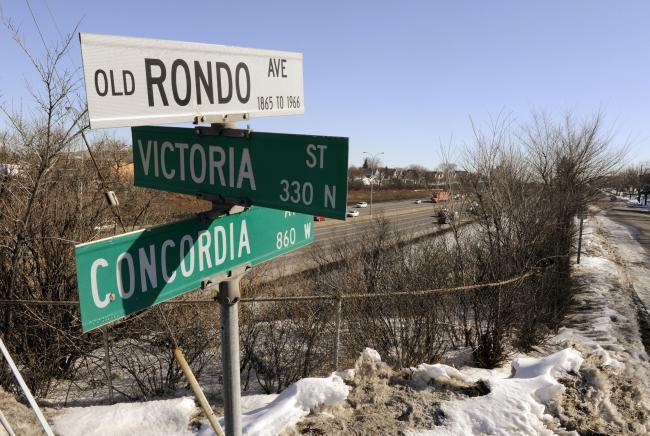 Rondo was six blocks North of Selby, and was exactly where Interstate 94 is today. This street and neighborhood were destroyed when construction began on Interstate Highway 94 between Minneapolis and Saint Paul in the 1950s. Black Churches and social service agencies like Welcome Hall, Hallie Q. Brown Community Center, Inc. and Ober Boys Club were the center of the community. Social clubs were essential to the community because Blacks were not allowed in White-owned hotels, dance halls, or restaurants. Before the forties a critical indication of social status in the community was by address. The houses at the east end of Rondo, between downtown and Western Avenue, were called Deep Rondo and made up the least desirable neighborhood. The area between Western and Dale was called Cornmeal Valley, the middle ground. West of Dale Street to Lexington Avenue was the more affluent area known as Oatmeal Hill. The corner of Rondo and Dale seemed to be where the action was. 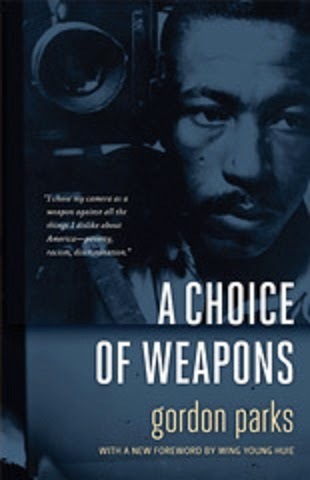 Photographer, film-maker and composer, Gordon Parks is proudly claimed by St. Paul and the neighborhood as a former resident although he only spent a few years there. He was raised in Kansas and when he was 15, upon the death of his mother, he was sent north to live with his sister in St. Paul. He tells a story in his book, A Choice of Weapons, about getting dressed up on Easter morning, with two of his buddies in identical forest green double-breasted suits, "the rest of the accessories : brown and white spectator oxfords, striped stiff-bosomed shirts, green ties and gray snap-brim hats" to stand on the corner of Rondo and Dale in front of Field's drugstore, "to give the world a break." 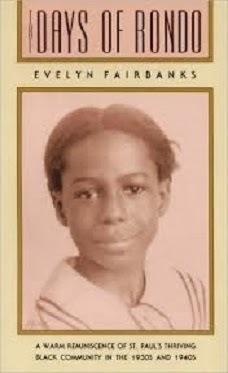 Author Evelyn Fairbanks has her own Rondo and Dale story. Born in St. Paul, Minnesota, Fairbanks spent a year in Omaha, Nebraska with her natural mother (Eva Mae Riddle) before resettling in St. Paul with George and Willie Mae Edwards. 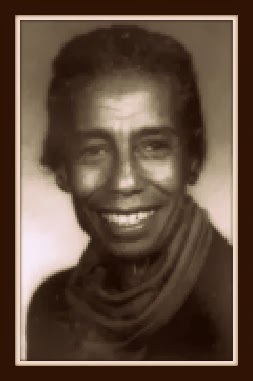 She attended Mechanic Arts High School and became the first black employee at Hamline University in St. Paul, as a cashier. Later Fairbanks received a bachelor's degree from the University of Minnesota at age 40. After the University, she wrote The Days of Rondo, a memoir of growing up in the 1930s and '40s in the thriving Rondo community, the largest Black neighborhood in St. Paul. In her book, she describes her Sundays. "Every Sunday right after church, most of the black teenagers in St. Paul gathered at Field's drugstore on Rondo and Dale... When I was sixteen one of my outfits was a grey wool walking suit with a three-quarter length coat, trimmed from neck to hem with silver fox fur, over a black chiffon long-sleeved blouse. With it I wore a black felt hat with a large grey plume in the back, black patent-leather high heeled shoes, and a black felt purse, and I carried wrist-length white gloves. I mean we were dressed to kill"
Fairbanks moved to a 20-acre tree farm near the small town of Onamia, Minnesota after she retired in 1991. Pneumonia in 1993 slowed her down and her breathing was often labored because of asthma. In 1995, she received an honorary doctorate from Hamline. I got to know the landmarks of Dale Street quite well from the car window, but never ventured down the side streets, with the exception of the basketball games when our church team scrimmaged against one of the Hallie Q. Brown's teams. Their team usually beat the pants off us. At home I had perfected a shot for our garage mounted basket on our driveway court. I would stand next to the house drain pipe, balance on the concrete splash block, and consistently swish the ball. The shot, however, didn't translate well to the hardwood, and I was lucky if I scored a few points. Speed and agility were never my strengths. Hallie Q. 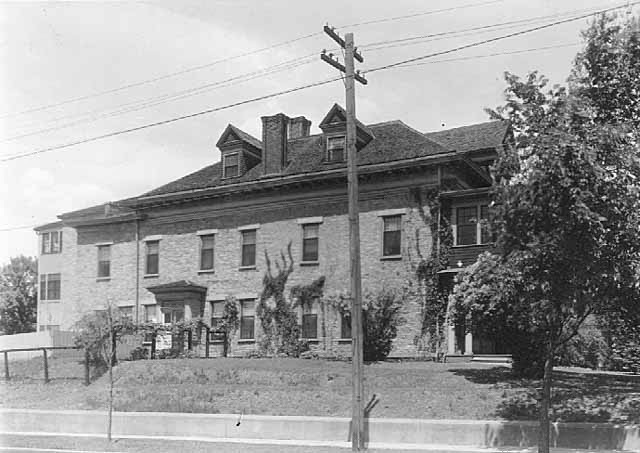 Brown Center, at that time was located on the corner of Aurora and Mackubin. It relocated in 1972 to the Martin Luther King Center at 270 North Kent Street. Almost every article or book you read on the Rondo neighborhood mentions the integral part that this center played for the residents through it's long history. On Sunday the family would pass through Frogtown and then the Rondo neighborhood before arriving at the church and parking either on Dale or Carroll streets. We never had trouble finding a parking spot as Dad considered us late if we arrived a half hour before the service began. Sunday School followed the service so it was always close to 3 hours before we were heading home. My "church friends" were all white and most had German names. I can only think of one exception and that was Charles Avery, a young Black man who lived in the immediate neighborhood. The Walther League youth group activities and the softball and basketball teams, sponsored by the church, made for some good times. When I started attending confirmation classes in 1952, one of the sessions was held on Saturday morning. 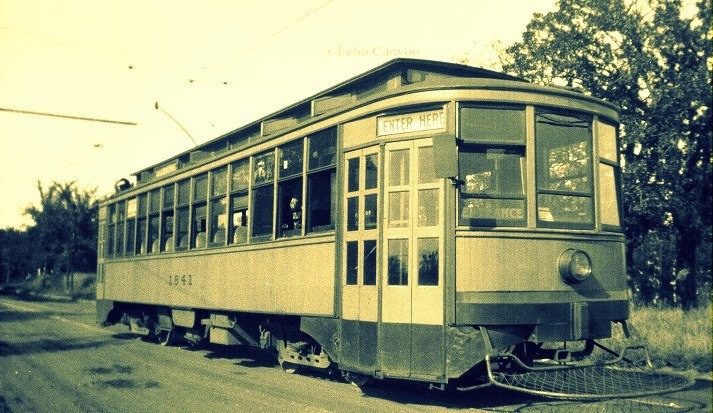 Since Dad was often at work, it was usually up to me to get there and back via the street-car. The weekend street-cars only ran every half hour, so on the trip back home, I would start walking north along Dale St. waiting for the big yellow street-car to arrive. 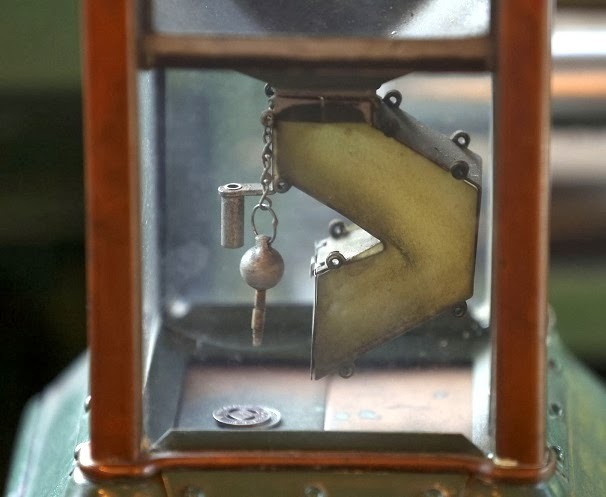 I loved the ride and still remember the woven seats, leather straps for holding on if the car was crowded, and was especially fascinated by the token box which the conductor would continually wind to move the tokens down and into position. The use of Tiger Jack as a symbol for the Rondo community is at best problematic. Little mention is made of the professional doctors, lawyers and businessmen that called Rondo home. Tiger Jack is the stereotype that whites can handle. His shack and contents were donated to the Minnesota Historical Society, and in 2003 a one block section of Dale Street was named to honor Tiger Jack Rosenblum and his wife. If I made it as far as University Avenue before the streetcar caught up with me, I would forget about riding, pocket the dime, and keep on walking. It was a little over 3 miles to home on Parkview Avenue from the church, so I still had a couple of miles to go, but there were plenty of things to see along Dale Street through the heart of Rondo and Frogtown. 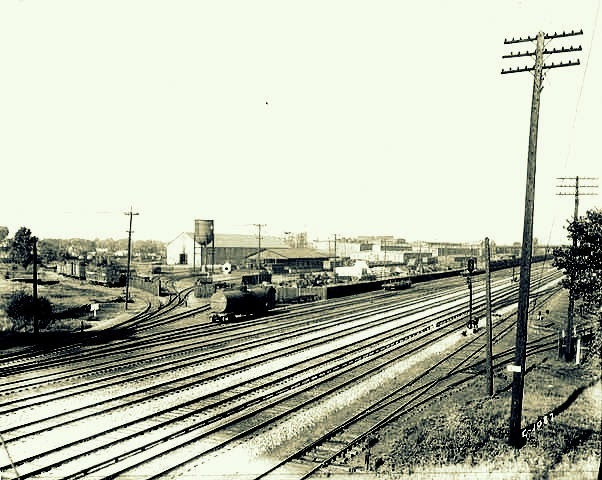 Further along, I would linger on the bridge over the Great Northern Railway yards just North of Minnehaha Avenue. It was a busy place with trains always on the move. Today with few trains running , the area is called Great Northern Business Park and is home to many small shops and industries. 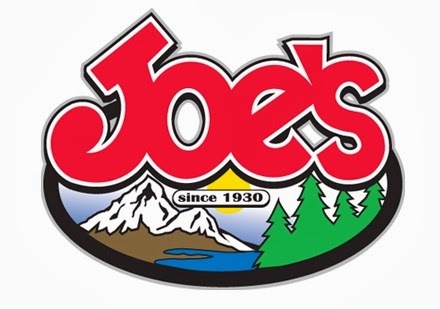 But my favorite stop was at Joe's Live Bait where I always checked out the minnow tanks. They knew me there since Dad and I were frequent minnow customers for our fishing trips to White Bear and Bald Eagle Lakes. Of course Joe's was not on our way and there were other places to buy minnows near the boat rentals but Dad was a loyal customer and one of my perks was being able to survey the minnows, scoop out those floating belly up and eyeball the new red and white dare devils and Lazy Ike fishing lures. I recently discovered another Rondo community connection. 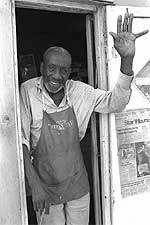 My high school history /social studies teacher, Charles Rogers lived there. In a Rondo History oral interview, (read it here) conducted by Mr. David Taylor with Charles Rogers on Sept. 14 of 1997, Rogers describes the difficulty he had in getting housing in St. Paul. 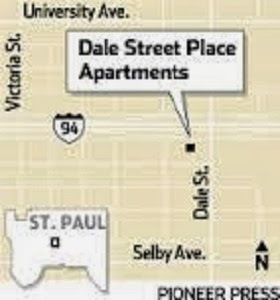 His first apartment was above Field's Drug Store at 620 Rondo, on the corner of Dale. Mr. Rogers was the first Black male teaching in the St. Paul public schools in the elementary school. 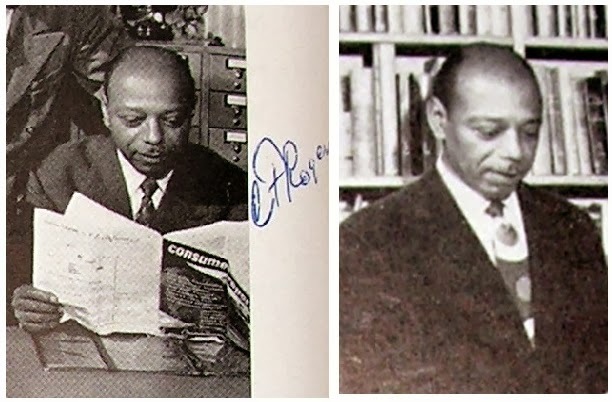 After teaching at both Maxfield and McKinley Elementary Schools, he moved onto Murray High School where he may have been the first Black working for this school in any capacity. 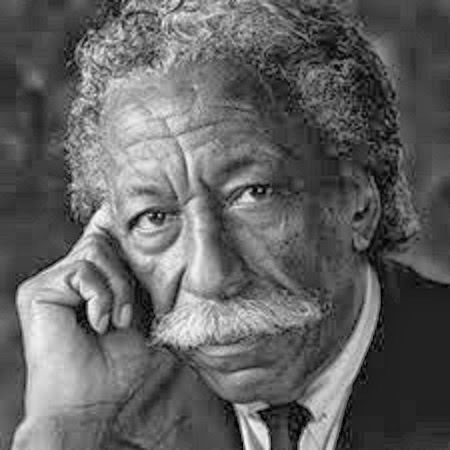 I was in his classes during those first years and remember writing papers on the N.A.A.C.P and the Urban league and on labor unions. His background as the Urban League's industrial relations secretary for the St. Paul chapter informed his teaching and provided a unique picture of the black person's urban struggles. His class lessons were alternative history not found in the standard school books, a window on a different world. Only after I graduated high school and left town, did Mom and Dad change their memberships to Bethel Lutheran Church on Wheelock Parkway, only a few blocks away from our home on West Parkview Avenue. It was also a Missouri Synod Lutheran Church. 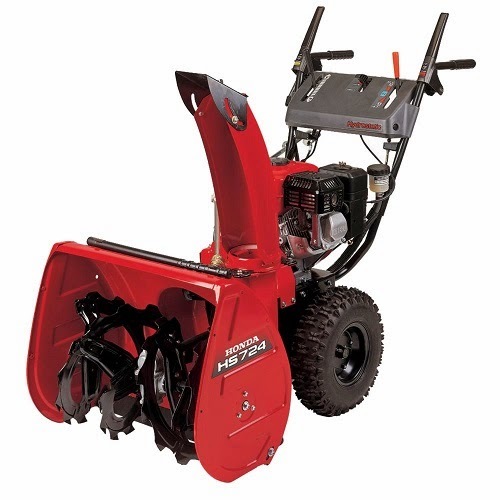 Dad also purchased a snow-blower since he lost his snow- shoveler to a college dormitory.